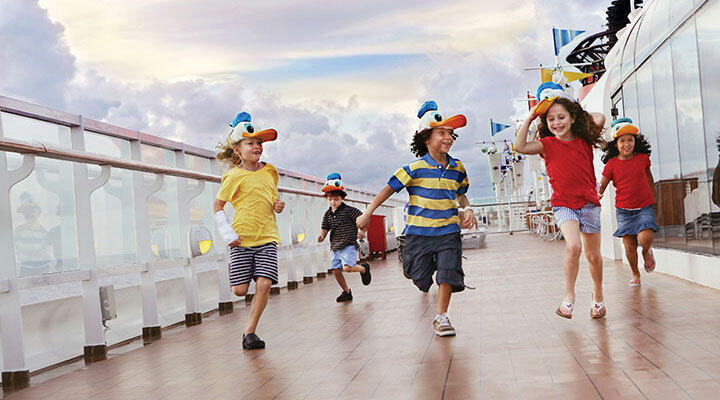 Navigate your best family vacation yet when you sail on one of the incredible Adventures by Disney Cruises. Just imagine falling asleep in Germany and waking up in the Netherlands. Or, falling asleep in Russia and waking up in Finland. That’s exactly what it’s like when you sail on an Adventures by Disney Cruise. You’ll be able experience multiple destinations with little to no time spent at sea. Charming river cruises and magical coast cruises await you when you sail with Adventures by Disney. Unforgettable memories and encounters are guaranteed no matter which you choose. We recommend extending your trip to stay a night or two in the most popular destinations before or after your cruise as well. It promises to be a land and sea vacation unlike any other! Immerse yourself in history and culinary delights when you embark on any of the Adventures by Disney Cruises on the Rhine River. Exciting excursions like riding a toboggan or ziplining through the Black Forest await your family. For those who love the holidays, choose the holiday itinerary. Your family will be amazed by the world-famous Christmas Markets in Strasbourg, the “Capital of Christmas.” Whether you cruise on the Rhine River during the holidays or not, you’ll be treated to idyllic destinations and unique activities. Check out all the destinations you can see on each itinerary below. Celebrate family as you travel through the heart of Europe during an Adventures by Disney cruise on the Danube River. Visit the Salt Mines of Hallein in Austria, tour Devin Castle in Slovakia or explore the quaint town of Cesky Krumlov. These are only a few of the exciting opportunities your family will have during their Adventures by Disney Cruise on the Danube River. Even more fun awaits, including a holiday celebration. Find out all the destinations included with each itinerary below. Once you’ve sailed on an Adventures by Disney Cruise in the Mediterranean, you won’t want to explore the Mediterranean any other way. From the exquisite Prince of Monaco’s Palace and treasures of the Renaissance to the towering Colosseum and sparkling waters of Capri, you’ll be amazed. Staying aboard the Disney Magic ship will only enhance your trip, adding a small touch of Disney everywhere you go. Whether you choose to sail five nights or 10, it will be a Mediterranean trip like no other. Revel in the wonder of Northern Europe when you cruise with Adventures by Disney in the Baltic. The countries you’ll explore include Denmark, Russia, the Netherlands, Estonia and more. Wander through the halls of Kadriorg and Peperhof Palace or gaze upon Temppeliaukio Church, cut directly from solid rock. Your family can enjoy several more excursions, as well as the option to add on three nights in Denmark for a magical land and sea vacation. Your Adventures by Disney Cruise in the Baltic takes place on the Disney Magic, ensuring your every need is taken care of from the first moment you board. The only hard choice you’ll have is whether to sail seven or 11 nights. You can compare destinations of both itineraries below. Please note, the above information about Adventures by Disney Cruises may be incomplete, seasonal, and/or subject to change at any time.